You're probably wondering where I'm going with this. This is the current state of my chin and muffin top. So this is also when baking screeches to a halt. No more of that divine chocolate brownies or scrumptious raspberry cake. It's back to a liquid diet albeit one made with a teensy sprinkling (it's a reverse psychology term) of butter and semi-skimmed milk (I feel a little thinner already). 1. Fry the onion and garlic with butter until fragrant but make sure it doesn't brown. 2. Dump the butternut squash and sweet potato. Fill the pot with a couple glasses of water, just enough to cover the vegetables and boil until you can mash them easily with a fork. Pour 1-2 cups of milk depending on how creamy you'd like it to be. Season with salt and pepper. 3. Puree with a blender. 4. Voila, now you can eat. If you feel particularly naughty, place a huge piece of bread right next to the soup bowl. Go on, you can always diet tomorrow (that's my favorite line). Mmmm! 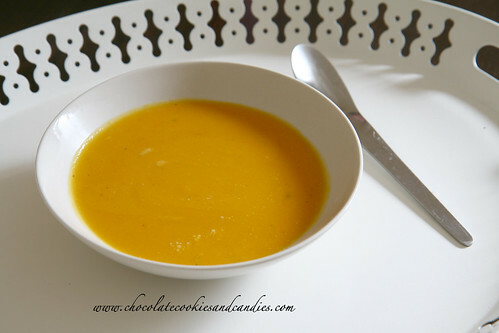 I make squash soup too - love the color and flavor! Ahh...the color, doesn't it remind you of our favorite brand? I love the it's sweet but at least I'm eating my veggies. yum. squash is expensive here so i use pumpkin n it's nice with a bit of cardamons. Squash and pumpkin --- I love them all !!! What happen ? Either I miss the call or L has not call for a week . Terri, I must give pumpkin a try. Hmmm...I've never thought of cardamons. How about doing a feature on soups? I'd love to try your take. Mi, oooops. I completely forgot to turn on my Skype. Things have been pretty hectic this week but will call you soon.